Starting today there is a huge sale at Toys R Us. 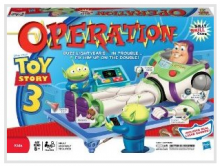 They have an in-ad sale for Toy Story 3 Buzz Lightyear Operation game for only $1. This is obviously going to sell out very fast so make sure you grab an ad and take it with you to Target or Walmart to get this game price matched! Offers Nov 6, 2011 in games, ToysRUs · Expired! ToysRUs deals and coupon match up! Smart Source had a special Hasbro coupon insert in this past Sunday’s paper. ToysRus has a ton of those items on sale this week. Here is the coupon matchup from this weeks Hasbro insert. Thanks you to Freebies 2 Deals for putting this together for us! Go to your local Toys R Us Store on Saturday, April 17th, between 11AM-1PM for a Thomas & Friends Play Date! Enjoy storytime, coloring fun, Thomas trivia, special offers and FREE gifts. Note this event is intended for children ages 3 and up. Also, be sure to print off this coupon here for $5 off Mega Bloks Thomas & Friends Busy Day at the Quarry Playset. This coupon is ONLY valid on Saturday, April 17th! Offers Apr 16, 2010 in free, kids, ToysRUs · Expired! I’m really glad Organic Deals & Coupons put together this great Babies-R-Us/Toys-R-Us deal summary. Here are the great deals available at TRU/BRU over the next couple of weeks. Free reusable tote bag. Just bring this coupon to guest services to claim your tote. Stores Apr 12, 2010 in BabiesRUs, kids, ToysRUs · Expired!